Capital of the department of Hérault, a part of the old province of Languedoc, France. It is sometimes called also "Har Ga'ash" = "Mountain of Trembling," "Har ha-Niḳra Pissulano" = "Mount Pessulanus," or simply "Har" = "Mountain." In the Middle Ages Montpellier was divided into two distinct cities, one being the capital of the Guillems, and the other the fief of the bishops of Maguelone. One of the most important communities of Languedoc existed here from the second half of the eleventh century. Through their relations with their coreligionists all over the world, the Jews of Montpellier helped enormously to build up the commerce of the city; and they at the same time contributed largely to the development of the school of medicine established there in the twelfth century. Guillem VIII., Lord of Montpellier, granted them in 1180 the right to practise medicine; and the kings ofAragon and Majorca, James I and James II., merely added (in 1272 and 1281 respectively) the proviso that the Jewish physicians must pass the regular examinations before exercising their profession. The progress made by these Jewish physicians was such that in 1300, according to Astruc ("Mémoires pour Servir à l'Histoire de la Faculté de Médecine de Montpellier," p. 168), the Jew Jacob b. Machir, called "Don Profiat" (Latin, "Profatius Judæus"), was appointed regent of the faculty of medicine. James I. interested himself in the Jews on many occasions, especially in 1252, 1266, and 1268, and confirmed them in all the privileges which they had enjoyed under his predecessors. These fortunate conditions changed in 1292, when Bérenger of Frédol, Bishop of Maguelone, ceded to King Philip the Fair of France the Jews then living in his territory. They were expelled in 1306, but returned to Montpellier in 1319, having been recalled by King Sancho, who protected them in 1320 against the fury of the Pastoureaux. On demand of the consuls, King John of France compelled the Jews in 1363 to wear the Jews' badge. In 1368 the same consuls forbade them to drink or to draw water from any well other than that which had been assigned to them ("Petit Thalamus," pp. 166-167). 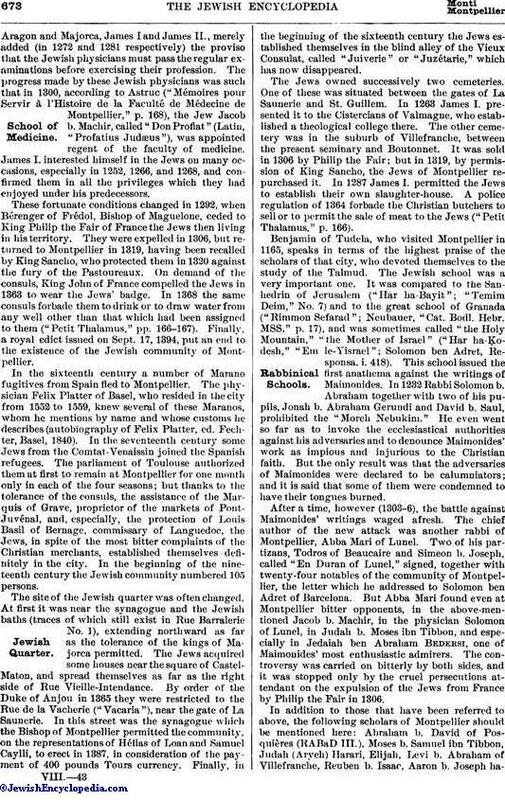 Finally, a royal edict issued on Sept. 17, 1394, put an end to the existence of the Jewish community of Montpellier. In the sixteenth century a number of Marano fugitives from Spain fled to Montpellier. The physician Felix Platter of Basel, who resided in the city from 1552 to 1559, knew several of these Maranos, whom he mentions by name and whose customs he describes (autobiography of Felix Platter, ed. Fechter, Basel, 1840). In the seventeenth century some Jews from the Comtat-Venaissin joined the Spanish refugees. The parliament of Toulouse authorized them at first to remain at Montpellier for one month only in each of the four seasons; but thanks to the tolerance of the consuls, the assistance of the Marquis of Grave, proprietor of the markets of Pont-Juvénal, and, especially, the protection of Louis Basil of Bernage, commissary of Languedoc, the Jews, in spite of the most bitter complaints of the Christian merchants, established themselves definitely in the city. 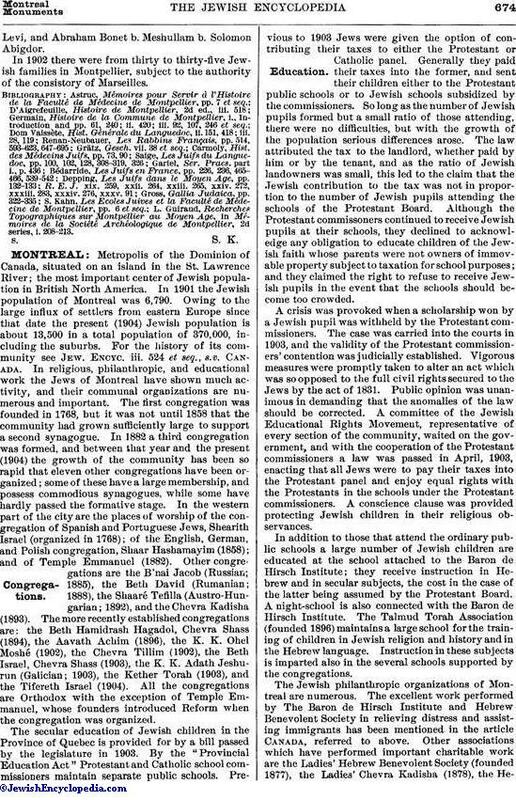 In the beginning of the nineteenth century the Jewish community numbered 105 persons. The site of the Jewish quarter was often changed. At first it was near the synagogue and the Jewish baths (traces of which still exist in Rue Barralerie No. 1), extending northward as far as the tolerance of the kings of Majorca permitted. The Jews acquired some houses near the square of Castel-Maton, and spread themselves as far as the right side of Rue Vieille-Intendance. By order of the Duke of Anjou in 1365 they were restricted to the Rue de la Vacherie ("Vacaria"), near the gate of La Saunerie. In this street was the synagogue which the Bishop of Montpellier permitted the community, on the representations of Hélias of Loan and Samuel Caylli, to erect in 1387, in consideration of the payment of 400 pounds Tours currency. Finally, in the beginning of the sixteenth century the Jews established themselves in the blind alley of the Vieux Consulat, called "Juiverie" or "Juzétarie," which has now disappeared. The Jews owned successively two cemeteries. One of these was situated between the gates of La Saunerie and St. Guillem. In 1263 James I. presented it to the Cistercians of Valmagne, who established a theological college there. The other cemetery was in the suburb of Villefranche, between the present seminary and Boutonnet. It was sold in 1306 by Philip the Fair; but in 1319, by permission of King Sancho, the Jews of Montpellier repurchased it. In 1287 James I. permitted the Jews to establish their own slaughter-house. A police regulation of 1364 forbade the Christian butchers to sell or to permit the sale of meat to the Jews ("Petit Thalamus," p. 166). Benjamin of Tudela, who visited Montpellier in 1165, speaks in terms of the highest praise of the scholars of that city, who devoted themselves to the study of the Talmud. The Jewish school was a very important one. It was compared to the Sanhedrin of Jerusalem ("Har ha-Bayit"; "Temim Deim," No. 7) and to the great school of Granada ("Rimmon Sefarad"; Neubauer, "Cat. Bodl. Hebr. MSS." p. 17), and was sometimes called "the Holy Mountain," "the Mother of Israel" ("Har ha-Ḳodesh," "Em le-Yisrael"; Solomon ben Adret, Responsa, i. 418). This school issued the first anathema against the writings of Maimonides. In 1232 Rabbi Solomon b. Abraham together with two of his pupils, Jonah b. Abraham Gerundi and David b. Saul, prohibited the "Moreh Nebukim." He even went so far as to invoke the ecclesiastical authorities against his adversaries and to denounce Maimonides' work as impious and injurious to the Christian faith. But the only result was that the adversaries of Maimonides were declared to be calumniators; and it is said that some of them were condemned to have their tongues burned. After a time, however (1303-6), the battle against Maimonides' writings waged afresh. The chief author of the new attack was another rabbi of Montpellier, Abba Mari of Lunel. Two of his partizans, Todros of Beaucaire and Simeon b. Joseph, called "En Duran of Lunel," signed, together with twenty-four notables of the community of Montpellier, the letter which he addressed to Solomon ben Adret of Barcelona. But Abba Mari found even at Montpellier bitter opponents, in the above-mentioned Jacob b. Machir, in the physician Solomon of Lunel, in Judah b. Moses ibn Tibbon, and especially in Jedaiah ben Abraham Bedersi, one of Maimonides' most enthusiastic admirers. The controversy was carried on bitterly by both sides, and it was stopped only by the cruel persecutions attendant on the expulsion of the Jews from France by Philip the Fair in 1306. In addition to those that have been referred to above, the following scholars of Montpellier should be mentioned here: Abraham b. David of Posquières (RABaD III. ), Moses b. Samuel ibn Tibbon, Judah (Aryeh) Harari, Elijah, Levi b. Abraham of Villefranche, Reuben b. Isaac, Aaron b. Joseph ha-Levi,and Abraham Bonet b. Meshullam b. Solomon Abigdor. 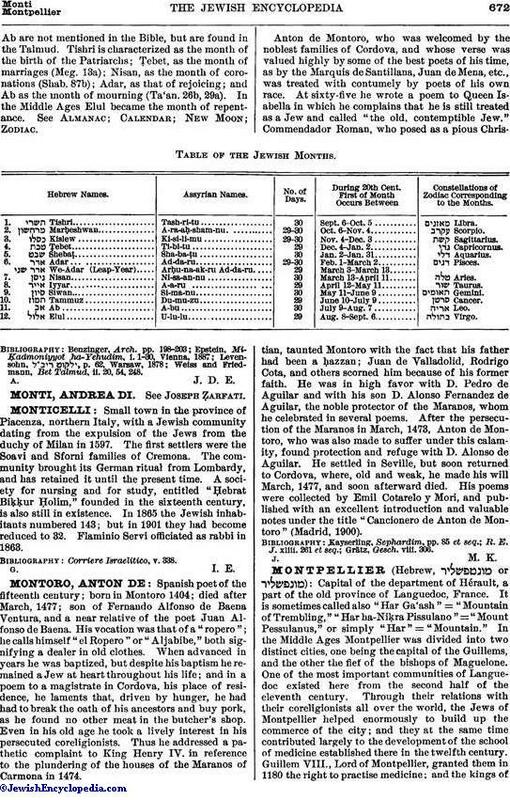 In 1902 there were from thirty to thirty-five Jewish families in Montpellier, subject to the authority of the consistory of Marseilles. L. Guiraud, Recherches Topographiques sur Montpellier au Moyen Age, in Mémoires de la Société Archéologique de Montpellier, 2d series, i. 208-213.